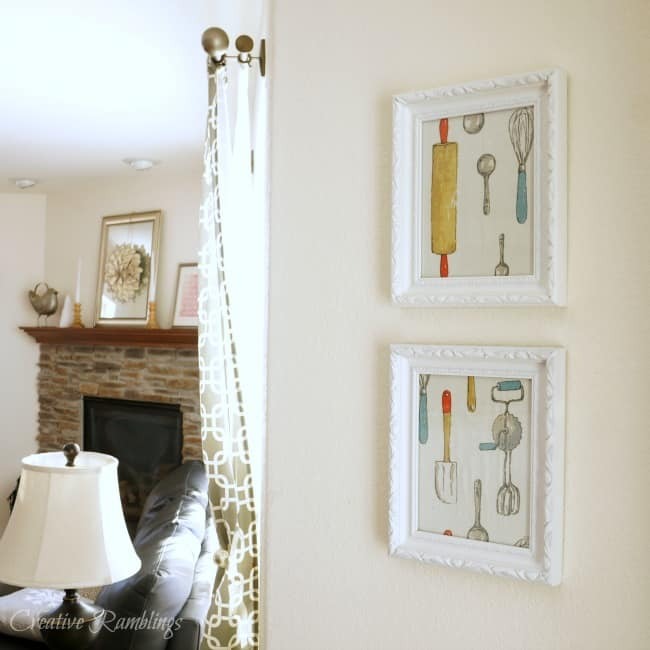 Do you have art in your kitchen? I have wanted some for a while but struggled with what to do and where to put it. I was inspired during my last trip to Target and instantly knew how to liven up my kitchen eating area. 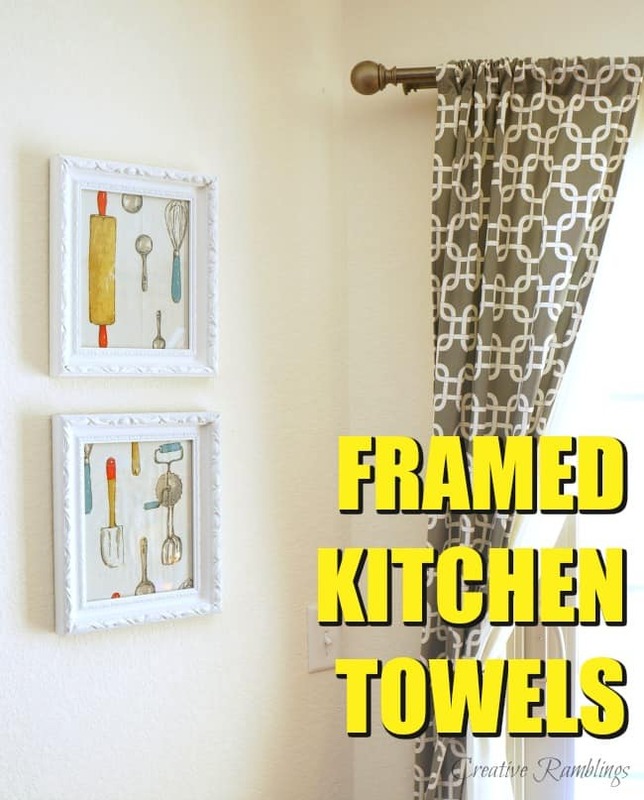 I picked up a printed towel and a few inexpensive (think clearance) frames, and after a few minutes had beautiful framed kitchen art. This was the easiest art I have made in a long time, and much less expensive than buying something or creating an elaborate painted sign. I traced 2 rectangles using the paper that comes inside the frame, then cut them out. I left a little extra on the sides so I could line it up just right in the frames. I used a hot iron to get the creases out then popped the fabric into the frames. My very open first floor is a mix of gray and white with pops of yellow. This dish towel incorporates those colors and a few others without being overwhelming. I love the little bit of whimsey from the kitchen tools too. 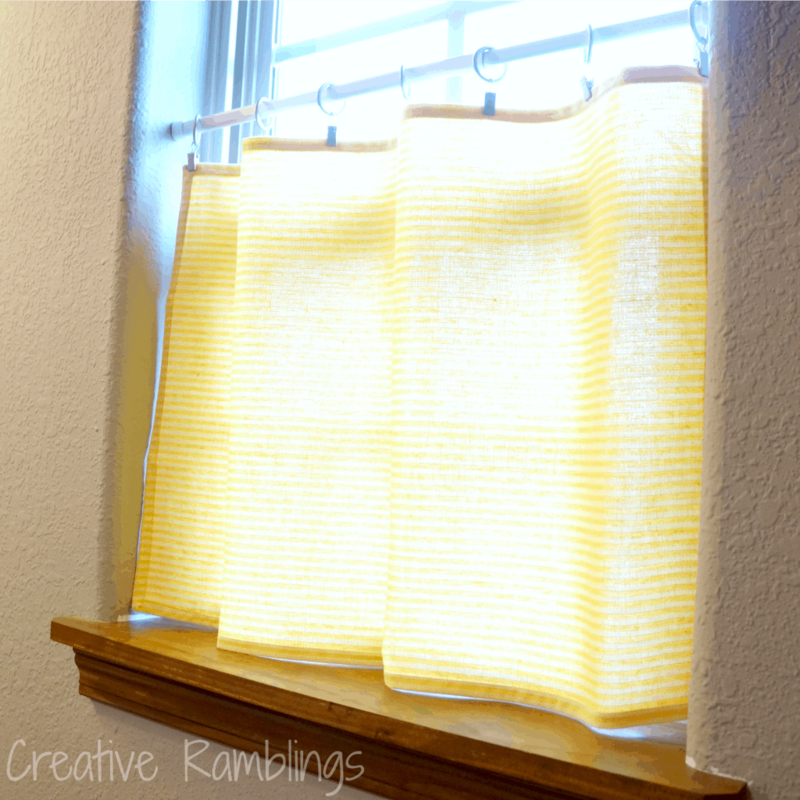 I have used Target dish towels for other projects too, it’s funny how something so simple can be so inspiring. 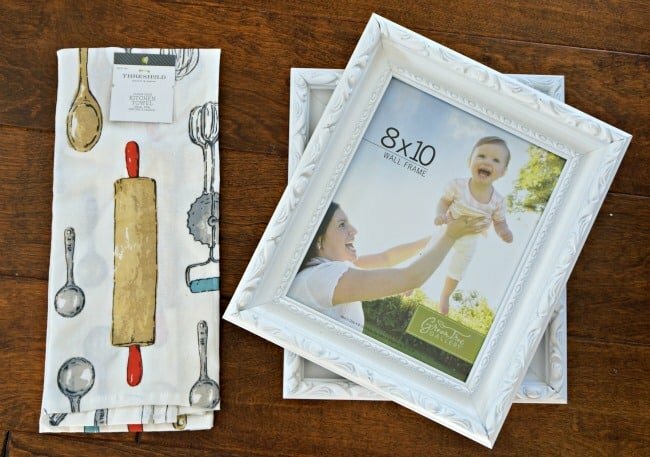 Have you ever decorated with dish towels? I’d love to hear about your creations. Yes, I have used dish towels in different ways – one that was a good idea was making an apron – sew a long running stitch along one long side of the dish towel, add a waistband with long strings attached on each end, and “Voila” you have a finished apron. All you needed was the waistband and strings on one side – the other sides were already finished! Saves a lot of stains on your clothes. That’s a great idea, and so simple too. Thanks for sharing Barbara!